Welcome to this Penthouse in Monteverde Rome.This property is the wise and intelligent choice for the smart traveller. It is positioned close enough to the historical center so that you can reach it in a few minutes without hassles but far enough to avoid the noise (if you enjoy a good night of rest after a busy day sightseeing and shopping) and the rip-off prices you are likely to expect in the heart of Rome. At sunset, allow yourself to unwind and relax on the terrace with a drink in your hand after a day spent sightseeing or shopping. Enjoy alfresco dining overlooking a unique view of Rome and its surroundings. The penthouse can accommodate up to 2 people and is made of one bedroom with a queen size bed, one chill-out panoramic veranda with one double sofa bed, one fully equipped kitchen, one dining room with one double sofa bed, one bathroom and one large terrace with a superb view.The neighbourhood is quiet and safe with the convenience of being just steps off the main city attractions. Grocery, banks, restaurants, pharmacy, etc. are all available on the corner. Its a short walk to all major transportation and convenient to everything in Rome. Transportation: Tram 8 and buses serve the neighbourhood. The closest tram/bus stop, is a 2-minute walk from the apartment. From there, it's about 8-10 minutes to Trastevere and 12-15 min. to Largo Argentina and 20 minutes to Piazza Venezia from where you can reach the main tourist spots. Trastevere train station is only 5 minutes away by tram 8. Please note that this property is rented as "locazione turistica" (touristic letting) under Italian Law 431/98 article 1, paragraph 2, letter C and Italian Civil Code art. 1571 to 1627 and no services are provided. Hi, my name is Andrea. I was born in Rome in March 1968 and I moved to London when I was 19. There I became a Solicitor of the Supreme Court of England and Wales where I practiced until 2006, the year I returned to sunny Rome. In 2007 I purchased this lovely property which I now rent as a holiday home. I bought my property in this location because is one of the little sanctuary you find in Rome. It reminds me of the quiet, nice and clean neighborhoods you have in London (it is called 'the small villas'), yet you are in Rome and only 15 minutes away from the vibrant, beautiful and sometimes noisy centre of Rome. Also being a penthouse apartment you can enjoy and excellent view of the City and its ventilated terrace offers a perfect oasis to escape from the heat during the hottest months. My property is located in a strategic position. Very close to public transport and local amenities. The terrace is surely a plus and its vicinity with the historical sites allows the minded traveller to rent a property at a very competitive rate without having to renounce to comfort and style. The Apartment is in Monteverde, just off Trastevere in a historic, residential, green neighbourhood with families & children and parks. The neighborhood is quiet and safe with the convenience of being just steps off the main city attractions. Grocery, banks, restaurants, pharmacy, etc. are all available on the corner. Its a short walk to all major transportation and convenient to everything in Rome. TRANSPORTATION: Tram 8 and buses serve the neighborhood. The closest tram/bus stop, is a 2-minute walk from the Apartment. From there, it's about 8-10 minutes to Trastevere and 12-15 min. to Largo Argentina. Trastevere train station is only 5 minutes away by tram 8. Location also convenient to reach NUOVA FIERA DI ROMA by car or public transport. The neighborhood is residential, well serviced by the tram and is very close to a big market with the moderate prices you would expect to find outside the tourist center. Very comfortable and accessible place to stay when visiting Rome with amazing views of the city. Hope to be back soon! For us the apartment was in a super location, a quiet area away from the crowds, with good shops nearby and easy access to the centre of Rome via the tram. The apartment was clean, well equiped and the furniture comfortable (although we did find the bed a little hard). The views from the terrace were stunning (well worth the climb up five flight s of stairs!). Andrea sent very precise directions on how to get to the apartment, which we found invaluable. Just spent a lovely weekend in the beautiful city of Rome staying at The Penthouse Monteverde. This is a spacious, clean and well laid out apartment with good access to the city centre on the frequent tram service which passes at the top of the road (the journey takes about 15 minutes and is cheap too). 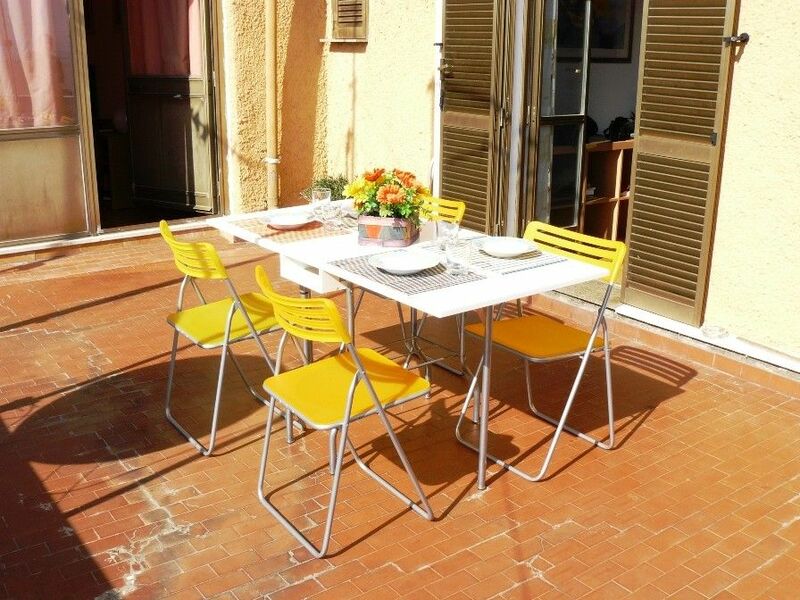 The apartment also has the added advantage of having a terrace where you can make the most of the Italian sunshine after a busy day's sightseeing.The owner provided excellent customer service and I would recommend his apartment to anyone wishing to stay in this area. The only downside was that we didn't want to leave! Holiday in Rome with my 3 teenage grandchildren. The apartment was great. The kids were delighted with SKY and were able to contact their friends on facebook using the wi fi. It is a 15 minute bus or tram ride away from the centre of Rome The bus and tram stops are just a few metres from the apartment. Everything was as described on the internet, including the fact that there is no lift. I did not have any problem with the number of steps to the apartment; it just took me a little longer than the kids. It was also reassuring to have the telephone and Andrea's home phone number available for any emergencies. After a hectic day it was really lovely to sit out in the balcony and watch the moon rise over Rome. At the top of the street is a Chinese restaurant which the kids loved. They were so friendly. Nearby is an excellent Italian restaurant. Warm thanks to Andrea and his father for all their help. Monteverde is in the most green district of Rome and is only 20 minutes driving from Fiumicino Airport, 30 minutes from Ciampino Airport and only 9 minutes from St Peter's Church. Penthouse Monteverde is in a strategic position 1 km from Gianicolo. It’s very easy to go to the centre: Piazza Navona, Campo de Fiori, Colosseo, Largo Argentina, Piazza Venezia, Via del Corso. Two steps away from Trastevere (the historical ‘heart’ of the Eternal City) you will benefit excellent transport facilities to the city center. The number 8 tram takes you straight to Rome historical center within a few minutes. Local amenities are available within a walking distance, i.e. parks, restaurants, pizza places, street and the famous Porta Portese flee market (opened every Sunday) is also very close. In few minutes the tram N. 8, which runs 24h non-stop can take you in the most sought-after shopping district or to admire some of most spectacular monuments of ancient history. You can check in at any time after 12.00. Check out strictly by 11 am. Early or late check-in possible only by prior agreement.